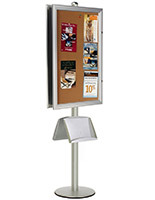 This Pedestal Stand has Two Snap Frames for Poster Displays! 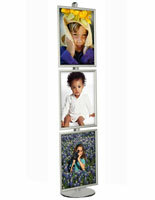 Double-Sided Snap Frame Poster Display!!! 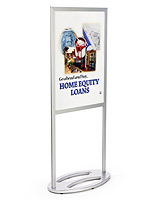 This pedestal stand is 8 feet tall with double-sided snap frame poster displays! 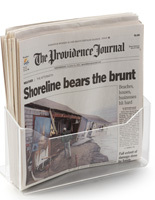 The pedestal stand maximizes your message exposure to the public. This pedestal stand accentuates any floor setting! Eight feet tall, this poster display exceeds the height of most poster frames and is eye catching in any crowd. Use this advertising tool to strategically promote any product, service or company. 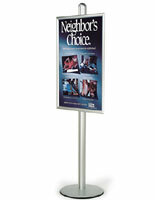 With a double-sided display area, this tall sign stand is very effective in crowded or large areas. 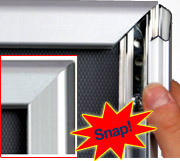 Two snap frames enable advertising exposure from both directions. This pedestal stand, freestanding display, is best suited for large indoor venues like exhibition, lobby, university or shopping mall areas. 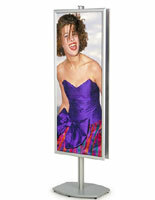 The pedestal stand, also known as a poster frame, is versatile and durable, made of sturdy aluminum. 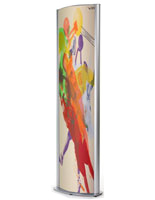 The poster frames are adjustable along the entire height of the display stand pole. Behind the poster frame there are connectors that run down from the pole. The level of the poster frame is adjustable, just tighten up the screws after positioning. The snap open poster frames make the loading of signs or graphics simple and quick. Simply snap open all four sides of the snap frame edges and insert the graphics behind the protective, non-glare plastic lenses, which protect your graphics and are non-reflective. The rounded base with rubber lining preserves the floor from any scratches. 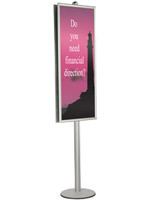 This pedestal stand is a classy unit that will make your ad message command attention!